Looking for the most efficient way to store your wine collection? Create a wine cellar in your kitchen with wine storage trays! These classic wine storage trays fit into any existing base cabinet within your kitchen!!! Finding your wine has never been easier! The slide-out shelves on our in-cabinet wine racks allow you to store from 12 to 30 bottles of your favorite wines. Solve the problem of wine storage once and for all when you add our in-cabinet wine bottle racks to your kitchen cabinets! 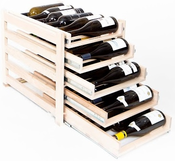 Select 12, 18, 24 or 30 bottle storage size, add your wine, and enjoy! Safe and Easy Wine Storage Right in Your Kitchen Cabinet! Keep your wine out of sight and out of mind with the wine storage solutions from Millwork City that include room for up to 30 bottles of your favorite vintage.